In advance of the 2018 Winter Olympic Games, Samsung and KT have deployed the first LTE-Railway network for the Wonju-Gangneung train line in Gangwon Province. This line, which is scheduled to start service this month, features trains which operate at 155 mph (250 kmh). This allows commuters to move between Gangneung on South Korea's east coast to Seoul within two hours. LTE-Railway (or LTE-R) is a new network technology which allows devices to maintain a constant LTE network connection in a moving train. One of the more challenging aspects of commuting by rail is having an inconsistent network connection. Particularly with high-speed rail systems, the train moves too quickly for mobile devices to maintain a connection to a tower for any length of time, prompting a fallback to 3G or outright disconnection. LTE-R aims to solve that issue by enabling constant train-to-train and train-to-ground communication with minimized tower-hopping. The network also brings support for the new Mission-Critical Push-to-Talk (MCPTT) standard, well as public address and emergency interphone features which can be used by railway employees during network congestion, including in emergency situations. Not all of these technologies are available to passengers—there are specialized handsets which support the extended mission-critical communication features. LTE-R includes a Quality-of-Service (QoS) system which prioritizes communication for railway operations. 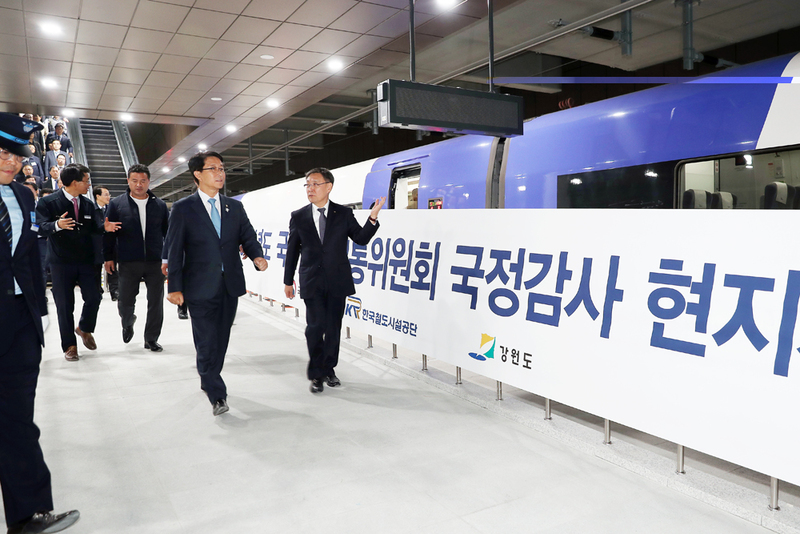 Samsung and Korean telecom firm KT announced today that the LTE-Railway (LTE-R) network for the new Wonju-Gangneung high-speed train line is now live. The activation represents the world’s first application of LTE-R technology to a high-speed train, with the new line traveling up to 250km/hour (155 mph). The network will include key features such as Mission-Critical Push-to-talk (MCPTT) based on the 3GPP standards Release 13. The new Wonju-Gangneung line, operated by the Korea Rail Network Authority (KRNA), spans 120 kilometers (75 miles) long, and will provide the public faster, easier access to the largest winter sports facilities in Korea, including PyeongChang. The LTE-R network is applied across the line’s seven stations, while the solution is interoperable with legacy Trunked Radio System (TRS), Very High Frequency (VHF) systems, and the national Public-Safety LTE (PS-LTE) network. LTE-R is a next-generation communications technology for smart train and metro services, enabling high-speed wireless voice and data communications inside trains, from train to ground and from train to train. In particular, LTE-R enables smooth and stable mission-critical communications – including MCPTT, group calls and VoLTE – between train personnel and control centers. In specific, Samsung has provided its radio access network operating in 700 MHz, a global band for LTE-based Public Protection and Disaster Relief (PPDR), a dedicated core network including EPC, IMS and PTT servers deployed in two control centers, as well as rugged smartphones (SM-G888N0) for professionals. Samsung, Korea’s leading LTE-R supplier, was elected as a supplier for all five LTE-R projects in Korea in 2015. Notably, its LTE-R solution is already in service on the 41 kilometer (26 miles)-long Busan Metro line 1 covering 40 stations in Korea’s second largest city. Launched by Samsung in April 2017, it represents the nation’s first case of LTE-R technology being used during operation of a train/metro. Samsung is also currently deploying LTE-R on the line between Incheon International Airport and Seoul Station in the center of the Capital.